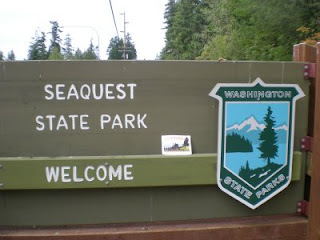 Last Sunday, I packed up the car for a road trip south to Portland. I would be picking up my sister at PDX and we were headed for the Oregon Coast and camping. "No need to check the weather report!" Check out this link for the Pemco Insurance Blue Tarp Campers commercial. "We'll bring our blue sky with us!" 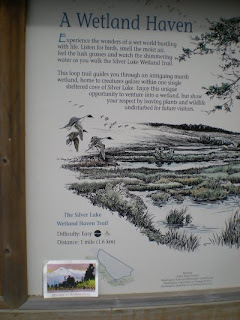 If you have driven I-5 south to Portland, you might have noticed that almost every couple of miles there is a sign saying "State Park next exit" I decided to check out some of those State Parks for a little hiking for hike-a-thon. I figured I could do a mile or so hike at each park. 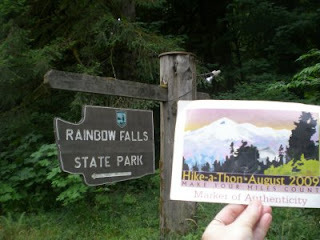 My first stop on the ride south was Rainbow Falls State Park. 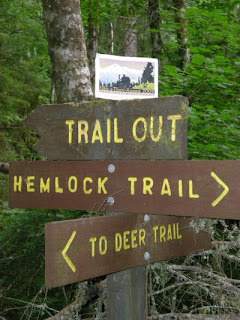 I hiked along the Deer Trail and the Hemlock Trail and actually hiked 2 miles because I was hunting for letterboxes along the way. 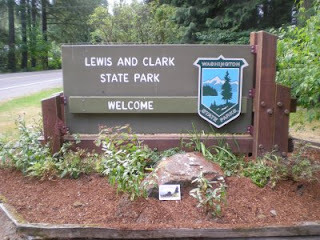 Back to I-5 and Lewis and Clark State Park , (not to be confused with the Lewis and Clark Trail State Park near Waitsburg, WA) was my next stop. 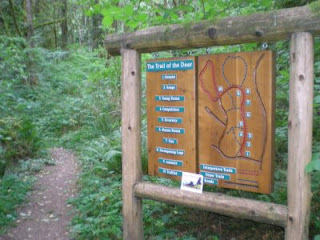 I hiked the Trail of the Deer (do ya see a pattern forming?) 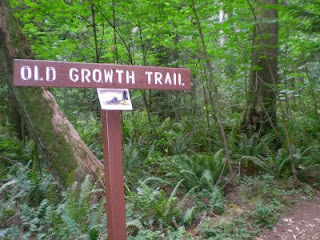 And the Old Growth Trail for a total of 2 miles. 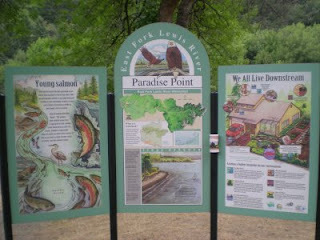 I also stopped at Paradise Point State Park, but I could not find any named trails to hike. This park is right on the highway. 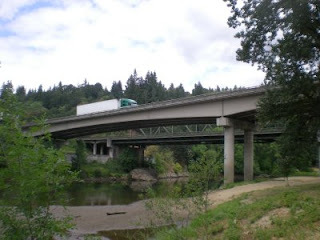 I have photos of the big rigs thundering by overhead. My sister was due in to Portland in a couple of hours, so I skipped Battleground State Park and went directly to Beacon Rock State Park. 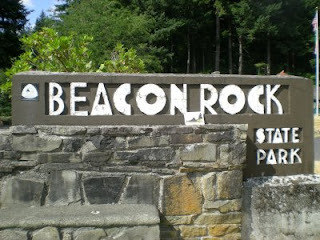 I hiked the 1 mile trail to the top of the rock and then headed back to PDX to collect my sister. 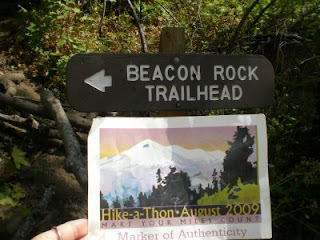 That brings my hiking mileage to 26 miles and $733 raised for WTA! Be sure to visit my WTA Fundraising page to see my progress towards $1,000! What were your results at Rainbow? Boxes still there? I thought maybe the Chehalis floods did some of those in? Rainbow Falls did have some damage. I found Somewhere in the Rainbow but only the first 3 and many of the landmarks for some of the other boxes were missing, changed or unidentifiable! 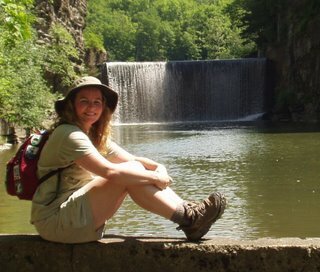 Way to fit the hiking into a busy day! I'm impressed!